Pune, once a shy retreat for pensioners, is now a booming business city—a second Mumbai just four hours by road from India’s commercial capital. Traditionally, it also has the reputation of being Maharashtra’s cultural and educational hub. But Pune has yet another side, being home to militant and ‘nationalistic’ Hindu ideologies for decades. Marathi Brahmin families scattered across the towns of western India suffered a backlash of sorts at the hands of pro-Congress Marathas and others after the Mahatma’s assassination. They mostly came and settled in Pune, an old Brahmin centre, carrying a deep resentment that runs through generations. This animus sporadically manifests itself, resonating with India’s politics of suspicion and hate. 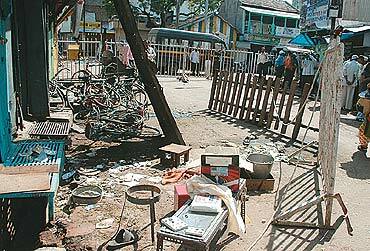 In recent weeks, Pune has been in the news after the Maharashtra anti-terrorist squad (ATS) turned its attention here in the investigations into the September 29 Malegaon blasts. The blast killed six and injured 90 and the terror trail led investigators to Sadhvi Pragya Singh Thakur and then later to Sameer Kulkarni, Major (retd) Ramesh Upadhyay, Abhay Rahirkar, Rakesh Dhawde and Lt Col Shrikant Prasad Purohit, a serving officer in Military Intelligence. All of them are from Pune and associated with Abhinav Bharat, modelled on an organisation founded several decades ago by Veer Savarkar. Himani Savarkar, married to Veer Savarkar’s nephew, has been the Abhinav Bharat national president since 2006 (see 'If We Can Have Bullet For Bullet, Why Not Blast For Blast?'). Though registered in Mumbai, Abhinav Bharat’s association is more with Pune since key members are from the city. The organisation’s activities clearly reveal its virulent character. In one pamphlet, it even exhorts members to seek revenge for the "killing of millions of Hindus over several centuries". It has also organised several "conventions" in Bhopal, Raisen and Vidisha districts of MP, where it is particularly active. At these conventions, it has described Muslims as "dharma shatrus (enemies of the faith)". More in tune with its militant character, one of the outfit’s slogans reads, "Kshama yachna nahin, ab to ran hoga, sangharsh bada bhishan hoga (No mercy or apology, now it will be war; the battle will be extremely intense)." Major (retd) Ramesh Upadhyay, arrested in connection with the Malegaon blasts, is the outfit’s working president. The new Abhinav Bharat took shape over several meetings held by senior members from Maharashtra and MP in 2006. It was at this point that Himani Savarkar was approached to head the organisation. According to her, at last count, Abhinav Bharat had nearly 500 members across the country. While the outfit was supposed to "fight injustice and combat terrorism", its presence began to be felt more through sporadic, suo motu acts of violence. According to reports, the group has been named in an attack on a Christian family in Jabalpur on August 3. Pastor Sam Oomen and his family were beaten up by a mob allegedly led by a vice-president of Abhinav Bharat. The ATS is also looking for Ramchandra Kalsangra—the brother of Shivnarayan Singh Kalsangra, who is already under arrest in the Malegaon blast case. On November 3, the ATS produced the transcript of an alleged conversation between Pragya Thakur and Ramchandra discussing details of the Malegaon blast. However, the authenticity of the transcripts has been contested by defence lawyers. On September 16, Abhinav Bharat members held a meeting at the Bhonsala Military School, Nasik, a few kilometres south of Malegaon where the blasts later took place. Interestingly enough, the request for using the school premises came from Lt Col Purohit. D.K. Kulkarni, secretary of the governing council which oversees the school’s overall functioning, says, "Purohit had served with the new commandant of the school, Col S.S. Raikar and so requested him to let the Abhinav Bharat hold its meeting in the school. While we didn’t know much about the organisation, I remember that its constitution did state that its primary aim was to fight against injustice." Spread over 160 acres, the Bhonsala Military School is different from other institutions of its ilk in that the curriculum stresses on religious instruction too. It seeks to instil "Bharatiya values" and the virtues of Lord Ram among its students. The school campus has been named Rambhoomi and its students Ramdandees. The symbolism blends the religious and the martial: they pray to an idol of Ram sculpted out of used cartridges. Kulkarni explains: "We created it out of the spent bullets fired by our students at the firing ranges." Purohit, who was posted with the local Army Liaison Unit (ALU) in Nasik before he moved to Panchmarhi to attend a language course recently, was a well-known figure at the school. Kulkarni says he "remembers that Purohit was posted here in Nasik. We had invited him to deliver talks to the students for some of the four annual lectures we organise every year". It was the Purohit connection to the blasts that led the ATS to the school and to its commandant, Col Raikar, who has also served with Military Intelligence. Cut to Lt Col Jayant Chitale, a retired air defence artillery officer who runs the Maharashtra Military Foundation (MMF). Chitale lives and operates out of a bungalow a few blocks from Purohit’s home off Law College Road, Pune. He says with some pride, "I have over 1,000 of my boys serving in the three services today. Each one has been brainwashed by me. They are motivated, determined and will do anything for the nation." Interestingly, a visitor’s book that Chitale has carefully preserved for nearly two decades lists the names of all the young men who trained under him. An entry on February 20, 1993, lists a young Shrikant Prasad Purohit, residing on Law College Road, Pune. "He was a brilliant boy," says Chitale, "This Malegaon blast could be the reaction of years of frustration within the army over denial of their rights and prestige. The politicians and the bureaucrats continue to ignore the military at their own peril and these acts could just be the beginning." Chitale, whose MMF is now floundering for lack of funds, had several ideas that upset the military establishment. In 2002, he raised a "suicide commando squad" of "dedicated Maharashtrian youth" to be covertly deployed "inside Pakistan". As news of this reached officialdom, the military brass rushed and requested him to desist from such activities. "There are several kinds of terrorism and these range from petty acts like chain-snatching to terrorism sponsored by foreign countries like Pakistan. If they blow up one bus in India, we must have the capability to blow up five of theirs. That is the only way we can tackle this kind of terror," says Chitale. His words echo Himani Savarkar’s credo: "I don’t believe in the philosophy of turning the other cheek if someone slaps you. We must strike back...why can’t we have a blast for a blast?" BJP can yet gain from "Hindu terrorism"